SBI PO Admit Card 2019 – The call letter of State Bank of India (SBI) Probationary Officer (PO) can be downloaded in May at sbi.co.in. Preliminary exam is on 8, 9, 15, 16 June 2019. Enter registration number and date of birth in order to login from link below. SBI PO Call Letter is released first for PET, prelims, then mains, and last for interview. Candidates must present admit card, photo identity proof and its self-attested copy, at exam centre on day of exam. Get here all SBI PO Admit Card 2019 download link, date, instructions, and other related details. It is important to download SBI PO 2019 Admit Card because it conveys the exam date, center (see REVISED CENTERS) and roll number. Also, without it, one cannot enter exam hall. Important dates for its download and related events are as follows. Candidates can download SBI PO Admit Card 2019 for preliminary exam, main exam, GE and PI, PET from here or official website, one by one. If candidate had filled online form for of SBI PO 2019 Recruitment and paid fees (Rs 750 or Rs 125 as per category) within deadline then in that case he/she can download admit card of SBI PO Prelims 2019. Download here: Candidates can download SBI PO Prelims Admit Card 2019 as per schedule at sbi.co.in/careers/. Also download Acquaint Yourself Booklet. This booklet contains important details such as about online exam, selection process, and sample questions. How to prepare for SBI PO without coaching? This is the first and most basic thing you need to do. Be thorough with the syllabus and solve questions. If you learn any new tip or trick for SBI PO, try to utilize them. You should learn something new everyday that helps you clear SBI PO, from teachers, friends, and online from blogs and Youtube. For example, check out these videos below. The first step towards achieving your goal is to convince yourself that you can. If even 1% of your thoughts tell you that if not this time then you will try again, then you will never succeed in one go. SBI PO is not very difficult as an exam, however, the competition is tough. Go through the topics, take a mock test or sample paper and honestly understand whether you need coaching or not. If you have hard time understanding any topic, or are just not able to get ahead, you should seek help. Utilize smallest of breaks by reading newspapers during commute, using apps and videos for enhancing learning. Nowadays online exams are common. Even then, there are high chances that you are more friendly with offline tests as that is something you have taken all the time in school and college. So just to get accustomed to online exams, do take mock tests. If you are spending 10 hours with books but not with concentration, then those hours do not count. Every minute that you study, do that with focus and purpose. Then scroll down and click Current Openings. 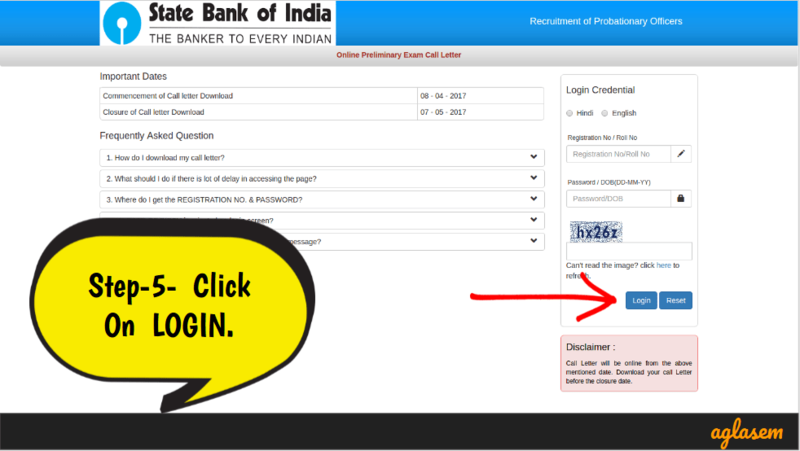 After that, again scroll and click link recruitment of probationary officers in State Bank of India. Click once on SBI PO Admit Card 2019 Download Link. Now that you are at login form, enter registration number, password or date of birth, captcha. Finally you can download and save SBI PO Admit Card 2019. Also take printout of call letter. 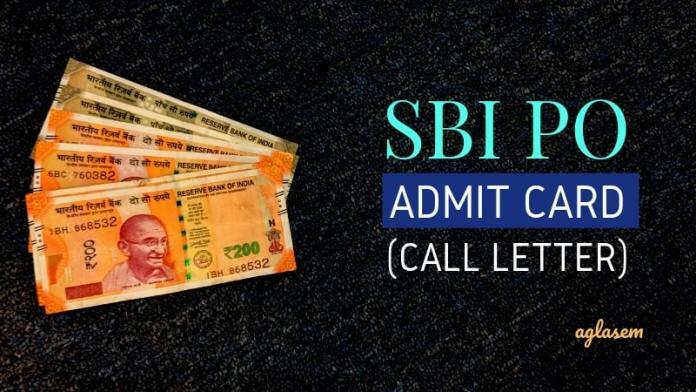 The following illustrations show how to download admit card of SBI PO 2019 from download link. Please note that the password mentioned in SBI PO Call Letter 2019 is the password that has to be entered at assigned system at test center to launch the test. See image below to get an idea of what call letter of SBI Probationary Officer recruitment looks like. Candidates must take the following items to exam center for SBI PO 2019 Exam. You will get rough sheet during exam. Candidates are asked to give their thumb impressions at various times while at exam center. Also, the exam conducting body may ask to capture photo of candidate in SBI PO 2019 Recruitment Exam. It is responsibility of candidate to ensure that they give correct thumb impression and cooperate during biometric verification. In essence, data in form, admit card, verification should be consistent. Therefore to avoid issues, do not have mehendi or other such chemicals on hand. Any discrepancy in general may lead to cancellation of candidature. SC, ST, Religious Minority candidates can opt for Pre Examination Training (PET) during form filling. Then candidates belonging to above-mentioned categories who have opted for SBI PO PET can download its call letter as per schedule from sbi.co.in. Training Centers List:- SBI PO Pre Examination Training is at Agartala, Agra, Ahmedabad, Aizwal, Akola, Allahabad, Asansol, Aurangabad, Bareilly, Bhubaneswar, Berhampur (Ganjam), Bhopal, Bangalore, Chandigarh, Chennai, Coimbatore, Dehradun, Dibrugarh, Ernakulam, Gangtok, Gorakhpur, Gulbarga, Guwahati, Hubli, Hyderabad, Imphal, Indore, Itanagar, Jabalpur, Jaipur, Kanpur, Kohima, Kolkata, Lucknow, Madurai, Meerut, Mumbai, Mysore, Nagpur, New Delhi, Panaji (Goa), Patna, Port Blair, Purnea, Pune, Raipur, Ranchi, Sambalpur, Silchar, Siliguri, Shillong, Srinagar, Toora, Tirupati, Vadodara, Varanasi, Vishakhapatnam, and also Vijayawada. Candidates are issued call letter for Mains exam in the event that they are shortlisted for main exam on basis of result of SBI PO 2019 Prelims. Overall number of candidates who can appear in Main Exam is equal to 10 times the number of vacancies. Since there are 2000 vacancies in SBI recruitment of Probationary Officers, therefore around 20000 candidates can appear in Online Main Exam. State Bank of India is recruiting candidates for Probationary Officer for overall 1000 vacancies. For the purpose of selection, the bank is conducting preliminary exam, main exam, group exercise and interviews. Given below are some of the most commonly asked questions on SBI PO Admit Card / Call Letter. Their answers are also given here. Qs 1. How to download my SBI PO call letter? Ans. Please refer how to download SBI PO Admit Card 2019 section above on this page. You can simply download admit card by clicking on download link given above and login with your login credentials. Qs 2. 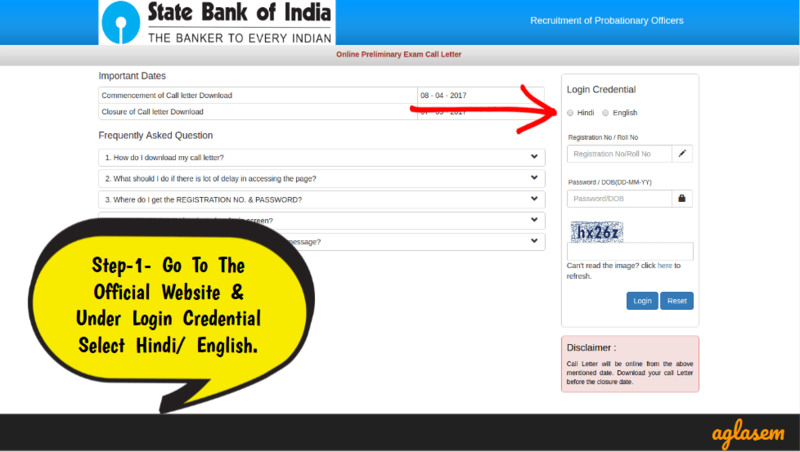 What should I do if the SBI PO Admit Card download page is not loading? Ans. Do not worry. This may happen either due to slow internet connection, or heavy server load on sbi.co.in, or other technical factors. Please try again in some time. Qs 3. 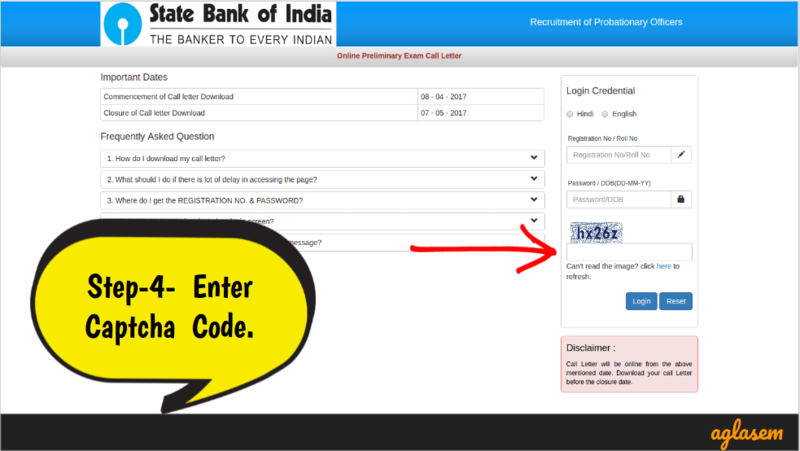 What to do if I have forgotten my registration number and password for SBI PO Admit Card 2019 download? Ans. 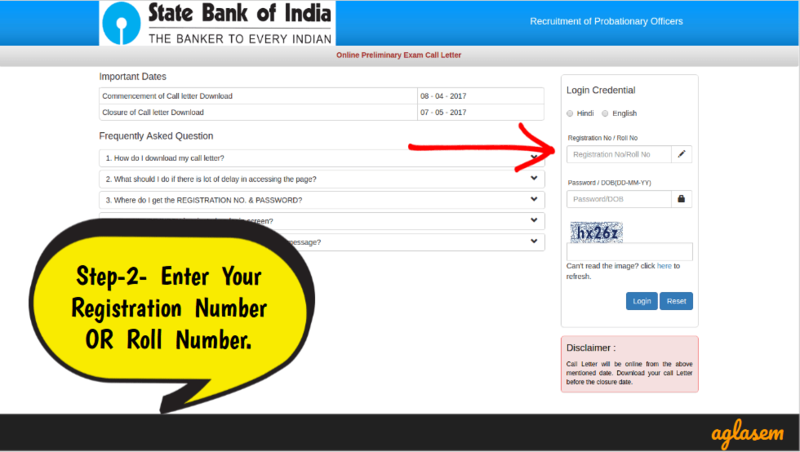 Registration number as well as password are auto generated at the time of registration (online form filling). At the same time candidates get an email acknowledging their registration. Consequently upon forgetting registration number, refer that email to know registration number. Instead of password, use date of birth to login. Qs 4. 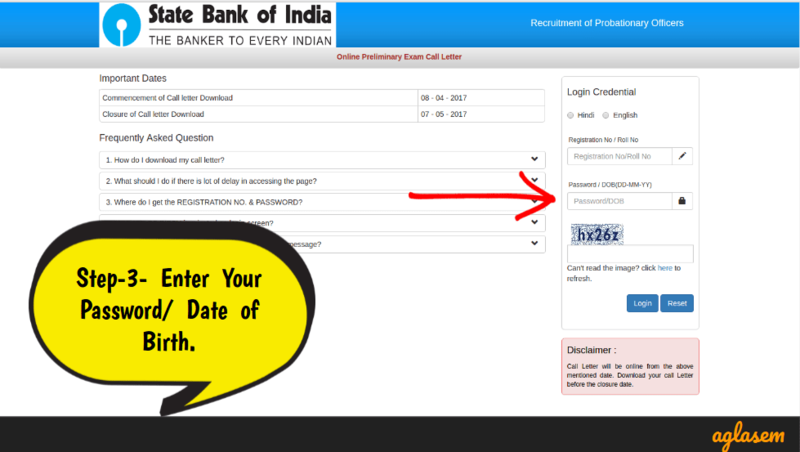 What to do if my date of birth is getting rejected at SBI PO Admit Card 2019 Download Link? Ans. 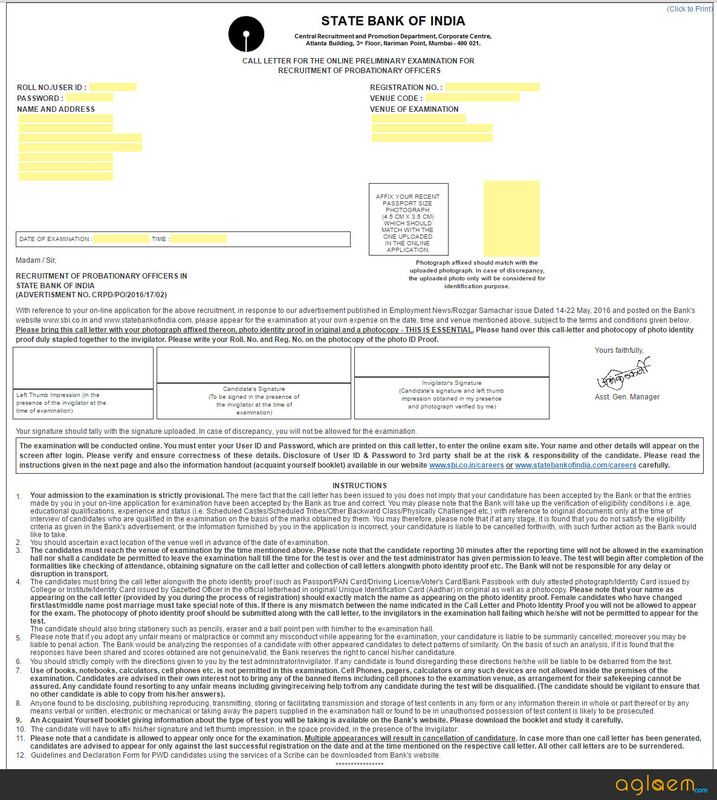 As has been noted, candidates can refer the registration acknowledgement email to know what date of birth was inputted in the form. Then use the same one. Candidates can contact the helpdesk in case of any queries. Another key point is that candidates should mention ‘RECRUITMENT OF PROBATIONARY OFFICERS IN STATE BANK OF INDIA-2019’ in the subject of the email. If you have any queries regarding SBI PO Admit Card 2019, then please ask in comments below.